A Fine Art Tribute, Each Personally Hand- Signed by Fats Domino! One of the country’s premier Art Deco artists, David Johnson teamed up with Michael Hunt on what many consider to be “The most beautiful concert poster ever created”. 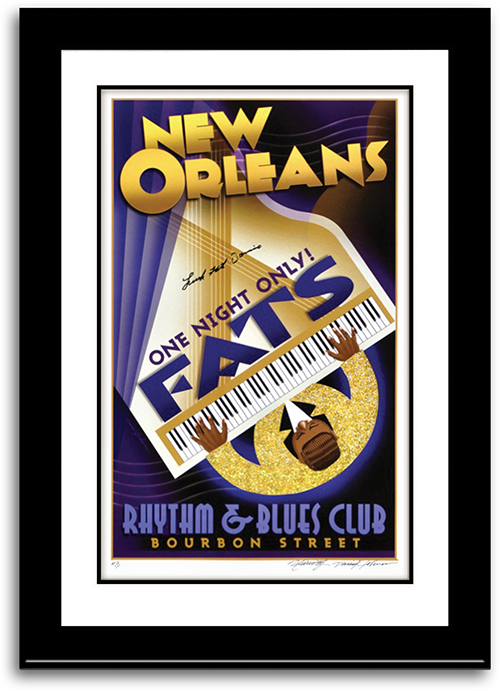 Fats Domino signing One Night Only prints. ​Michael sitting on Fats Domino "Pink Caddy" sofa with Fats Gold Records above. Each hand-signed by Fats! Individually numbered and hand-signed by both artists. Fats was known for his elaborately jeweled rings worn on both hands. 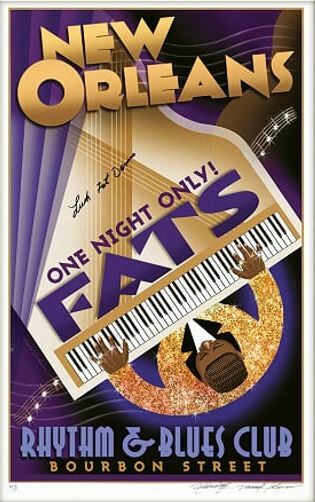 Individual rhinestones have been applied to Fats’ hands to recreate his signature look, as well as to the musical notes.